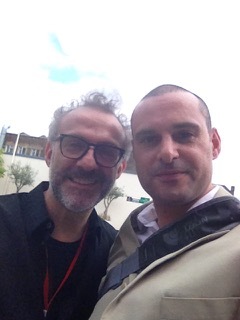 Bumped into Chef Massimo Bottura & Francesco Mazzei at Bellavista food festival in London, The largest Italian food & wine show. Massimo Bottura is an Italian restaurateur and the chef patron of Osteria Francescana, a three-Michelin-star restaurant based in Modena. In 2014 he was awarded the White Guide Global Gastronomy Award and received first place in TOURING 2014 Guide with a rating of 95/100. Francesco has worked with or opened a plethora of restaurants, in an equally impressive number of capitals; Edinburgh, Milan, London and Bangkok to name a few. Francesco’s recipes have appeared in magazines and newspapers wildly across the world and he demonstrates regularly on TV shows in the UK. An avid consultant, he has teamed up with a variety of individuals and brands to bolster their businesses with his flare. 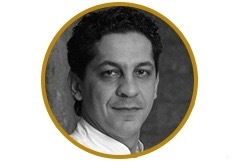 In 2008 Francesco Mazzei joined L’Anima restaurant.